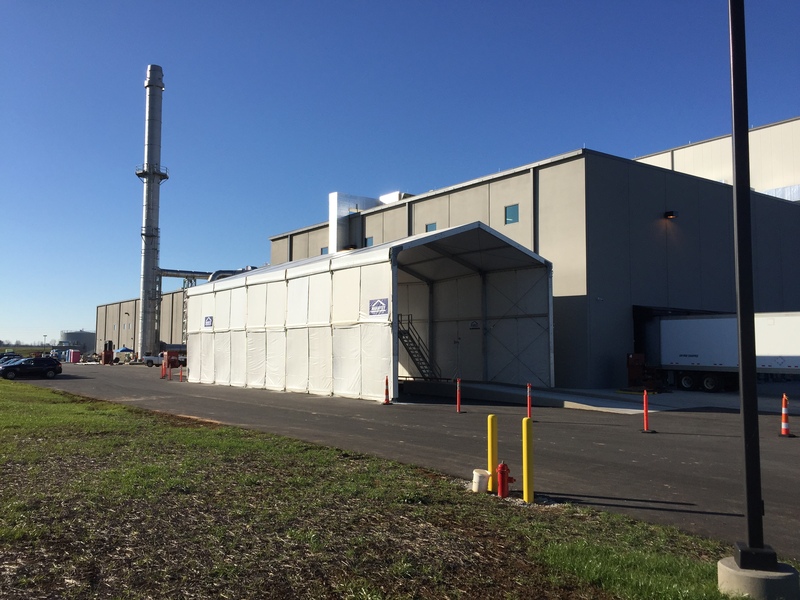 A prestigious pet food company contacted Mahaffey with a need for multiple structures that could cover unloading and sampling areas at their brand new $85 million dollar plant. They also needed a structure to cover the facilities' off-loading area. The structures would provide the facilities trucks and drivers with a sheltered area for transportating products to and from the facility. These covered areas were needed to protect the company's sensitive products from the harsh elements during off-loading processes thus avoiding any possible contamination to its sensitive products. Trucks bring food products to a scale over which a platform stands. A person on the platform samples the contents of the trailer to determine its acceptability. If the load is accepted, the truck heads to the next area to off load its contents. Both the scale and platform required shelting from the elements in order to avoid contamination of the product. After that, the truck progresses to an off loading area which required covering as well. Here, the drivers back into a structure that contains specialized piping to empty the food products from the trailer and forward them to containers found inside the building. During the initial planning and developing stages of the project, Mark Lewis, Mahaffey Project Manager, was able to obtain a better understanding of the company's overall goals and project needs. During this time, the company expressed an interest in using a 50' x 66' sized structure to cover areas where delivery trucks backed in for unloading. Mahaffey's site inspections proved extremely valuable in identifying what structure, or structures, would be best suited for the company's needs, goals and job requirements. This step provided an excellent opportunity for Mark to meet with the company's team to learn more about the job's needs. Together, they assessed areas where problems could occur and where structures needed to be located for optimal solutions. It also gave him a firsthand look at where both the truck scale and the crow’s nest platform were located for sampling contents of truck trailers. This area also needed to be covered and cleared. Once on site, an unexpected obstacle was presented to Mahaffey's teams after discovering that the loading dock had been moved since the original site inspection. A custom piping was now lying in its place and encroaching on the space allocated for the structure. Mahaffey's responsive teams and install crews worked together to find a creative solution to the pressing problem by placing the structure in such a way that would allow us to install around this piping. This solution also protected the structure from the 250 degree temperatures of the pipes by venting the structure walls to allow for the needed safety margin. Mahaffey's structures enabled the company to test and off load the contents of all incoming trailers without the risk of cargo contamination, or exposure to climate challenges. Additionally, Mahaffey's ability to cover the irregular site area with flexible structure sizes was an advantage for this project. More particularly, our ability to cover a truck scale with an eave height of 20’ proved extremely beneficial for this project. Further, our vast inventory also came ready with 20’ legs, which allowed us to complete the job without charging the customer for any additional customization costs. Interested in learning more about manufcaturing covers and temporary structure solutions, or want more information about how you can get a custom fabric building for your business?